Metadata associated with the NGINX Plus plugin for collectd can be found here. The relevant code for the plugin can be found here. This is the SignalFx NGINX Plus plugin. Follow these instructions to install the NGINX Plus plugin for collectd. The niginx-plus-collectd plugin collects metrics about a single NGINX Plus instance, using the /status endpoints exposed with the ngx_http_status_module, documentation here. NGINX+ Overview: Provides a high-level overview of key metrics for each NGINX Plus instance. NGINX+ Server Connections: Provides connection and SSL metrics for a single NIGNX Plus instance. NGINX+ Server Server Zones: Provides server zone metrics for a single NGINX Plus instance. NGINX+ Server Upstreams: Provides upstream group metrics for a single NGINX Plus instance. Using the example configuration file 10-nginx-plus.conf as a guide, provide values for the configuration options listed below that make sense for your environment. and how to enable them. By default only a subset (32) of the available metrics (87) are published by default. The remaining metrics can be enabled by opting-in to additional metric groups. 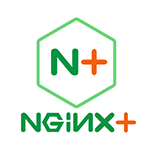 plugin_instance will contain the IP address of the NGINX Plus instance as given in the /status/address response and the port given in the StatusPort configuration property. information, cache, server zone and upstreams metrics. Server Zone metrics are emitted for each server in each status zone. To include these metrics, add ServerZone true to the plugin configuration, e.g. Memory Zone metrics are emitted for each shared memory zone that uses a slab allocator. To include these metrics, add MemoryZone true to the plugin configuration, e.g. Upstream metrics are emitted for each server in each http-context upstream group. To include these metrics, add Upstream true to the plugin configuration, e.g. Cache metrics are emitted for each cache, e.g. proxy cache. To include these metrics, add Cache true to the plugin configuration, e.g. 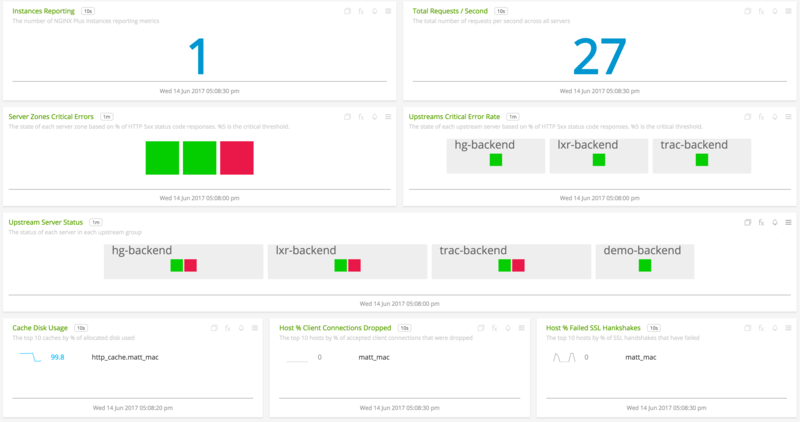 Stream Server Zone metrics are emitted for each server in each stream-context status zone. To include these metrics, add StreamServerZone true to the plugin configuration, e.g. Stream Upstream metrics are emitted for each server in each stream-context upstream group. To include these metrics, add StreamUpstream true to the plugin configuration, e.g. Process metrics only include the default dimensions. To include these metrics, add Processes true to the plugin configuration, e.g. The total number of bytes read from an origin server rather than the cache due to a matching proxy_cache_bypass directive. This metric is reported with the dimension cache.name to indicate the name of the cache. The total number of bytes written to the cache that matched a proxy_cache_bypass directive. The total number of responses from an origin server rather than the cache due to a matching proxy_cache_bypass directive. The total number of responses written to the cache that matched a proxy_cache_bypass directive. The total number of bytes read from an origin server due to expired cache entries. The total number of bytes written to the cache due to expired entries. The total number of responses from an origin server due to expired cache entries. The total number of responses written to the cache due to expired entries. The total number of bytes read from the cache with valid, fresh data. The total number of responses read from the cache with valid, fresh data. The total number of bytes from responses not found in the cache and fetched from the origin server. The total number of bytes written to the cache after fetching from the origin server due to a missing entry. The total number of responses taken from the origin server and not the cache due to a missing entry. The total number of responses written to the cache after fetch from the origin server due to a missing entry. The total number of bytes from revalidated responses read from the cache. The total number of revalidated responses read from the cache. The total number of bytes from stale responses read from the cache due to the origin server not responding correctly. The total number of stale responses read from the cache due to the origin server not responding correctly. The total number of bytes from stale responses read from the cache while the entry was being updated. The total number of stale responses read from the cache while the entry was being updated. The total number of accepted client connections. This metric is reported with the dimension nginx.version. The total number of dropped client connections. This metric is reported with the dimension nginx.version. The total number of abnormally terminated and respawned child processes. This metric is reported with the dimension nginx.version. The total number of client requests. This metric is reported with the dimension nginx.version. The total number of bytes received from clients across a single http server status zone. This metric is reported with dimension server.zone.name to indicate the name of the server status zone. The total number of bytes sent to clients across a single http server status zone. The total number of requests completed without sending a response across a single http server status zone. The number of client requests that are currently being processed across a single http server status zone. The total number of requests received from clients across a single http server status zone. The total number of client responses with a 1xx status code across a single http server status zone. The total number of client responses with a 2xx status code across a single http server status zone. The total number of client responses with a 3xx status code across a single http server status zone. The total number of client responses with a 4xx status code across a single http server status zone. The total number of client responses with a 5xx status code across a single http server status zone. The total number of responses sent to clients across a single http server status zone. The total number of failed SSL handshakes. The total number of successful SSH handshakes. The total number of session reuses during SSL handshake. The total number of connections accepted from clients across a single stream server status zone. This metric is reported with dimension stream.server.zone.name to indicate the name of the stream server status zone. The total number of connections completed without creating a session across a single stream server status zone. The number of client connections that are currently being processed across a single stream server status zone. The total number of bytes received from clients across a single stream server status zone. The total number of sessions completed with a 2xx status code across a single stream server status zone. The total number of sessions completed with a 4xx status code across a single stream server status zone. The total number of sessions completed with a 5xx status code across a single stream server status zone. and name of the individual server, respectively. The total time the stream upstream server was in the unavail, checking, and unhealthy states. to indicate the upstream group name and the individual server name. The total number of times a stream upstream server entered the unhealthy state due to failed health checks. of the upstream group and name of the individual server, respectively. upstream.name and upstream.peer.name to indicate the upstream group name and the individual server name. dimensions upstream.name and upstream.peer.name to indicate the upstream group name and the individual server name. The total number of times an upstream server entered the unhealthy state due to failed health checks. and the individual server name. memory.zone.name to indicate the name of the shared memory zone. indicate the name of the cache. The current number of active client connections. This metric is reported with the dimension nginx.version. The total number of idle client connections. This metric is reported with the dimension nginx.version. The current number of client requests. This metric is reported with the dimension nginx.version. The current number of servers removed from the stream upstream group but still processing active client requests. This metric is reported with the upstream.name dimension to indicate the upstream group name. the upstream.name dimension to indicate the upstream group name. The current number of servers removed from the group but still processing active client requests.